Even though type 2 diabetes is extremely pervasive, this condition can almost always be prevented with proper lifestyle changes. Some seniors can even reverse their diabetes by altering their diet and boosting their cardiovascular health. Here’s a quick glimpse at a few steps you can take to help your senior parent prevent diabetes. 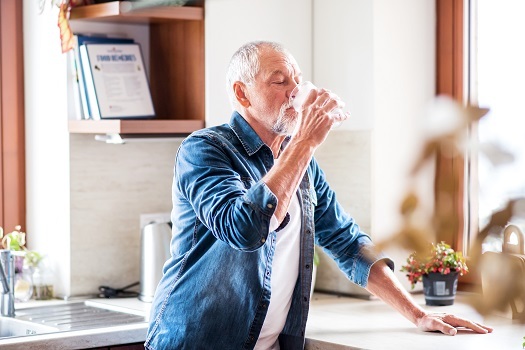 There are quite a few reasons seniors should try to stay well hydrated throughout the day. In addition to making them feel fuller for longer, water also enhances how the body responds to dietary sugars and insulin. Every senior has different hydration needs, but most should try to drink around eight full glasses of water per day. Those who are active or live in hot climates might need to double that amount. Having one or two sugary beverages every day could wreak havoc on your parent’s health and greatly increase the risk of developing type 2 diabetes. Drinking a soda or cup of juice shocks the cardiovascular system and overworks the pancreas. If your parent has been diagnosed with prediabetes, he or she might need to cut out sugary drinks entirely. Many people are surprised to hear smoking can increase the risk of diabetes. According to the CDC, smokers are nearly 50 percent more likely to develop type 2 diabetes than nonsmokers. To quit smoking, your parent might want to consider nicotine replacement therapy, which gradually reduces the intake of nicotine over the course of a few months. Sticking to a nutritious diet is your parent’s first line of defense against diabetes and many other metabolic diseases. Most of the foods your loved one eats should be packed with protein, healthy fats, and complex carbohydrates. He or she also needs to avoid sugary snacks, simple carbohydrates, and other foods that cause insulin levels to spike. If your loved one lives alone, you may not be able to monitor his or her dietary habits, but a trained professional caregiver can do this and much more. Living with a serious health condition can make it challenging for seniors to age in place. However, they can maintain a higher quality of life with the help of professional live-in care. Richardson seniors can benefit from assistance with meal prep, bathing, transportation to the doctor’s office, medication reminders, and much more. A sedentary lifestyle is another major risk factor for diabetes, which is just one of the many reasons seniors need to exercise a few times a week. Going for a brisk walk, doing chores around the house, gardening, and going for a swim are all great options for older adults. Your parent can also speak with the doctor about coming up with a safe and effective workout routine. Seniors with mobility issues or health challenges that make it difficult to exercise on their own can benefit greatly from the help of a trained professional caregiver. Richardson home care service professionals can be a wonderful boon to seniors. Whether they require around-the-clock supervision or just need assistance with exercise and household tasks a few days a week, seniors can enjoy a higher quality of life with the help of trusted in-home caregivers. When your loved one doesn’t get enough sleep, his or her body may overproduce glucose and become more resistant to insulin. Your parent might also crave carbs and sweets throughout the day to keep his or her energy levels up. The best way to get restful sleep is to follow a strict bedtime routine every night and wake up at the same time every morning. Diabetes is a common condition among seniors, so it’s crucial for family caregivers to be able to identify the risk factors to prevent the disease in their loved ones. Maintaining a high quality of life can be challenging for some seniors, but professional caregivers can help them obtain this goal. Families can trust Richardson at-home care experts to help their elderly loved ones focus on lifestyle choices that increase the chances of living a longer and healthier life. Trust your loved one’s care to the professionals at Home Care Assistance. Reach out to one of our Care Managers today at (469) 573-4213 to learn more about our high-quality home care services.